The Pioneer of the Year Award recognizes the Fellow who has showed the greatest pioneering spirit in the last year, starting one or more new initiatives and modeling to others that fulfilling dreams is possible. The award went to Khin Lapyae Wom (2015) who pioneered and led a new fundraising event on February 12th, 2018. The fundraising event involved 35 alumni, successfully raised 5,200,000 Kyats to help active alumni Go Do Good projects, and will become a regular event in the DeBoer Alumni calendar each year. The Network Hub Award recognizes the Fellow who has contributed the most to connecting people together and helping others get their needs met. This year, it was awarded to Ei Ei Aung (2017) who created opportunities for DeBoer Alumni to meet up and keep in touch each other. Ei Ei actively called other alumni to catch up with them and help them, led some social gatherings (like the “Spash Together” Thingyan party in April), organized service events like caring for the eldery that brought Alumni from different batches together, and in other big and small ways helped her fellow alumni when they needed it. The Project Impact Award recognizes the Fellow who has demonstrated the most positive impact from a project done in the past year. 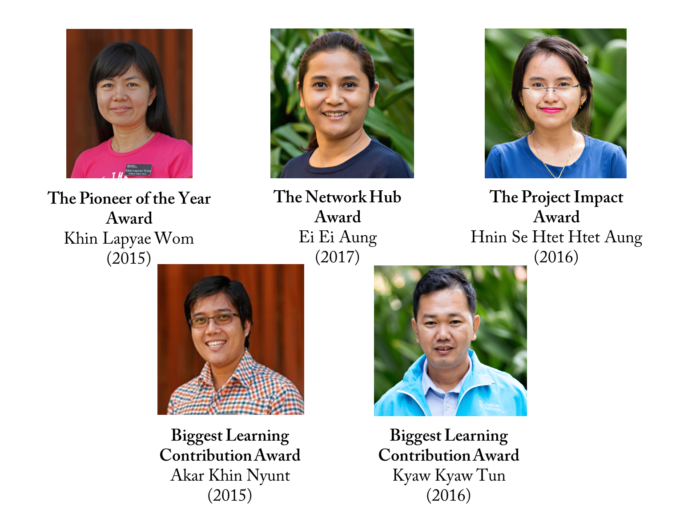 This year the award was presented to Hnin Se Htet Htet Aung (2016), for her tremendous efforts leading positive change in her company, MSP/CAT. Hnin Se built two different libraries at her workplace to encourage her colleagues to read books that develop their skills. She has led a number of trainings where she shared Fellowship content with fellow employees. And she invested her money and time into mentoring two other friends, who needed training and coaching for their job preparation and guided them to get a good job. Hnin Se’s small, consistent efforts have added up into huge impact for her company and her colleagues. Biggest Learning Contribution Award recognizes the Fellow or team that has made the biggest learning contribution to the DeBoer Network over the past year. The award is given to Arkar Khin Nyunt (2015) and Kyaw Kyaw Tun (2016). Together, they led a Speaker Series event in Sittwe that attracted 112 participants (our biggest event ever!) and showed all of us the tremendous potential of the Speaker Series in areas outside of Yangon. Their leadership had significant influence over plans for the Speaker Series in 2019, as well as for a number of new plans to reach out to regional groups of alumni living outside of Yangon.